Just yesterday, I posted the first photo of the Menards Halloween setup. I tagged it "Halloween Creep" and put it in that category on the blog here, but I don't think that concept has broken through in a similar way that it has with people talking about the concept of "Christmas Creep" in the media and online. As I've talked about in the past, the topic of Christmas Villages and the associated world of holiday miniature villages isn't something that I'm particularly proud of, but it *is* something that totally fascinates me. I mean...we *do* have a town called Mantleburg after all. But, with the moves and temporary living situations/holidays at my in-laws place in Naperville, Mantleburg hasn't even made an appearance - let alone grow or annex new structures into the community. Historically, the Mayor of Mantleburg has always taken a stand against Spooky Town and said that he's drawing a line at the holiday of Christmas, so we've never annexed in any Spooky Town Halloween structures, even though they've intrigued him over the years. 1. Ghost silhouettes circle inside windows. 2. Ghost silhouette fade in and out on window. 3. Ghosts revolve behind the unit. 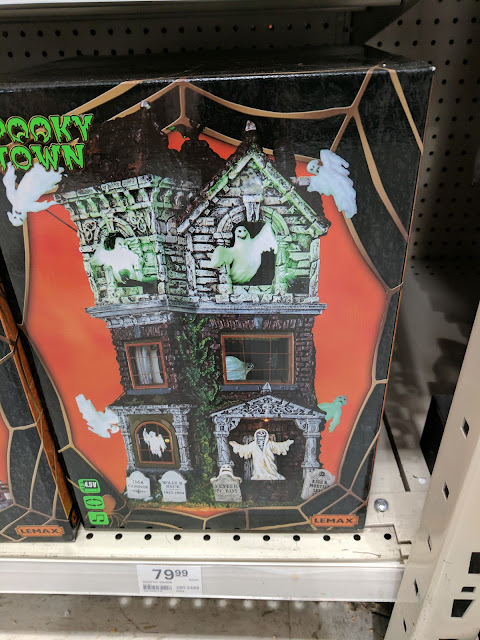 Below is the box in stock at Menards in Bolingbrook, but there were only a few of them. They're listing it for $79.99, but if they don't sell, Menards always puts their seasonal/holiday stuff on sale the closer we get to the holiday. We'll have to broker a meeting between the Mayor of Mantleburg and Natalie to see if there might be room in the City budget to have a Halloween party this year? I hear that Mantleburg is going to be applying to keep their Sanctuary City status like Rahm is doing in Chicago, so I would think that they'd welcome these ghosts and ghouls, right? I'm not sure this will ever go on sale enough to make it fit in the municipal budget, but who knows!? !